The Twin Towers were located in Lower Manhattan and were dedicated in 1973. This building was designed by Minoru Yamasaki and Emery Roth & Sons. The complex consisted of seven buildings, two of which were the tallest in the world. #1 stood 1,368' tall to the roof and 1,727' tall to the spire with 110 floors. #2 stood 1,362' tall with 110 floors. This pewter replica's base measures 6 inches by 7 inches and the towers are just over 9 inches to the rooftops and it is finished in new pewter. This model's scale is 1 inch = 150 feet. For more pics and info check out our blog. 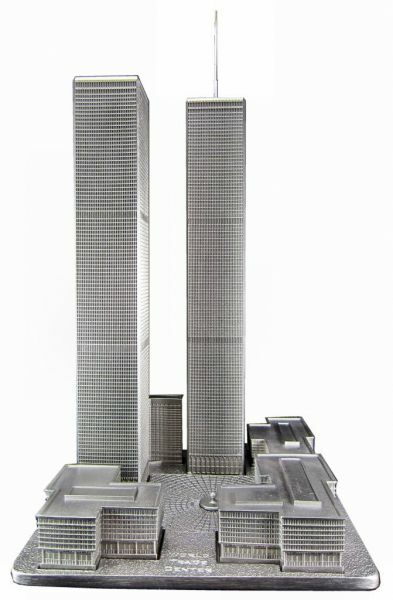 I've been looking for a model if the old WTC for years, and this is the best one I've found by far. Details are precise.